We have the perfect gift for the barbecue master in your family – our BBQ Gnome! This jolly chef wears his apron and is carrying his serving utensils and cleaver, on the way to grill up a wonderful feast. The red and white checkered rag hanging over his shoulder completes the classic look and adds to his authenticity. At 21 inches tall, he's large and in charge, and will be the hit of the party at your next family get-together. A natural location for this happy fellow would be out on the patio, next to the grill. Because he's made from weather-resistant cast stone resin, he'll hold up even when it's not perfect barbecuing weather. He's pictured both indoors on a kitchen counter and outdoors on the deck to show that our chef gnome has versatility. Our chef garden gnomes make it easy to cook up a great gift for the foodies in your life. 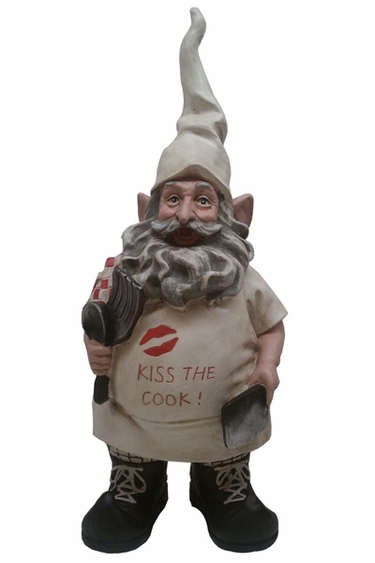 Anyone who likes to cook will love our cooking gnome!